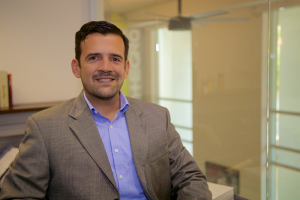 Architect Richard Cuebas is the co-founder and vice president of Integra Design Group, which has offices in San Juan, Santo Domingo, and Charlotte, NC. A native of Puerto Rico, Cuebas visited the island in the wake of Hurricane Maria, which made landfall in September. Cuebas said his firm will be part of the solution as the island continues to endure an historic crisis, one that could define the island for a generation. The Zweig Letter: I see where you graduated from the University of Puerto Rico. Are you from there? If so, what kind of satisfaction do you get from working in the place where you were born and reared? In the face of the natural disaster that struck there, what are your thoughts? Richard Cuebas: I was born, raised and educated (except for two years in Tempe, AZ. for my M. Arch from ASU), in Puerto Rico. Starting a business and making it grow on my island has been ultra-satisfying! Integra has grown in 17 years so much in fact, that we (my partners) agreed that we had to extend our firm’s reach out to mainland USA. That’s how two years ago I decided to move with my family to start a branch in Charlotte, NC. Hurricane Maria was so powerful, in my opinion, that kids in the future will be learning its effects on Puerto Rican society in general in their history classes. This storm, combined with the now 11-year-old economic recession, created a crisis, and getting out of its effects will take another decade, in my view. TZL: What are you seeing on the ground in Puerto Rico in the wake of Hurricane Maria? RC: I left the island the eve of the storm and flew back four weeks later. And even as the main roads are mostly clean from debris, and trees are already springing back, the devastation was painfully evident. The infrastructure (particularly power, communications, coastal amenities and roads), was hit very hard. I’m sure that many of the island’s coasts and mountains will show the scars from the wind and storm surges for years. What I also see is that, despite the huge inconvenience of living without power and reliable clean water for weeks/months, the people of Puerto Rico are resilient, with high spirits, and ready to sweat their way back to normalcy. TZL: In your opinion, what are the long-term effects of Hurricane Maria going to be, in terms of the entire fabric of the island: population, infrastructure, economy, political stability, etc.? RC: There will be detrimental long-term effects from Maria due to the accelerated loss of population (Puerto Rico will lose 1 million people in 20 years, which means almost a quarter of its 2006 residents). This will bring collateral damages such as a smaller working class and decreased economic power of the remaining residents. This population change alone will be of historic proportions. On the other hand, the big investments needed for the recovery will result in a more resilient built environment: sturdier schools and homes, safer roads, better communications, etc. Construction codes are due to be revised to add resiliency measures. Another bright spot will be the push towards renewable energy and micro-grids. TZL: Is your firm active (or will it be) in the relief/restoration effort in Puerto Rico? If so, what role will your firm take? RC: We at Integra look forward to working hard to redesign Puerto Rico into a resilient, renewables-focused island. We have been actively involved in damage assessments for some of our clients, and are already working on recovery efforts within the private and public sectors. We are also developing our strategy for a big pro-bono initiative to donate our design time to help not less than 100 families that lost everything during the storm get a new, sustainable and resilient home. TZL: Based on what you have seen and experienced in Puerto Rico, and knowing that another hurricane could hit at some point in the future, what needs to happen to restore water, electric, and more resilient structures to the island? RC: Building with resiliency in mind is key. We need to design structures (and organizations) to be able to spring back to working order in much less time than what we could when Maria came. Initiatives include micro-grids to power key infrastructure (hospitals, manufacturing facilities, universities, public safety buildings), limiting construction in flood-prone areas and improving our construction codes and inspections to ensure sturdier buildings. We – as a society – need to better organize the preventive and rapid response practices in key areas such as fuel distribution, wireless communications and port/airport services. TZL: What will be the role of the private sector in rebuilding Puerto Rico? RC: I think that we as Puerto Ricans have been under the wrong idea that everything “for-profit” is evil, and that successful entrepreneurs promote “special interests” that damage our society. This recovery is our opportunity as business owners to show the opposite is true, that we can help in the rebuilding effort in a more efficient, agile and economical way than what the public apparatus can. TZL: What will be the role of the public sector? RC: This is also the government’s opportunity to trust in the private sector and open to competition some state-owned monopolies such as electrical production and distribution, and many of the island’s ports and airports. TZL: For AE firms that want to have meaningful work, what is the opportunity like in Puerto Rico? RC: We must use this crisis as an opportunity to promote the “value of design.” Informal structures built outside of code regulations suffered the most damage in the wake of Maria. It is our duty as licensed architects and engineers to advocate for formal, code-compliant construction, which means we need to find ways to make A/E accessible to all, no matter his/her social class. TZL: Amid the devastation in Puerto Rico, what is the most uplifting thing you have seen there? RC: I would say that public servants and private employees working in restoring the power to the island have earned great respect for working long hours to bring power back to many in much-shorter times than what FEMA anticipated. It’s still a very difficult time for the 60 percent of Puerto Ricans that live without power, but given the scale of damage, things will come back to “normal” faster than what was feared.